Singapore's Formula One night race, now in its fifth and final year of its contract, commences this weekend. Negotiations are taking place with Formula One Administration, though it may be as late as the middle of 2013 until it is known if an agreement has been reached, according to Bloomberg News. A night race has its advantages for both Singapore and F1. The race will draw approximately 40,000 visitors to an ever-growing list of events that this year boasts Katy Perry, Maroon 5, and Jay Chou. This translates to an average of $227 million for Singapore's economy. While the race is the main course, it’s the entertainment, networking events, tourism revenue and a heavy investment on the part of Singapore to it's downtown area, that are the gravy topping this lavish weekend. "Singapore forecast arrivals to rise to 17 million and tourism spending to S$30 billion ($24.5 billion) by 2015. The opening of two casino resorts that include a downtown convention center and a Universal Studios theme park spurred a 13 percent increase in visitors last_year after a 20 percent climb in 2010. The country expects the number of tourists to rise as much as 9.8 percent to 14.5 million in 2012." Craig Baird of SC Global Racing Porsche also thinks the run on the Marina Bay street circuit has advantages not only for Singapore but also for fans and drivers. "The Grand Prix has elevated Singapore's standing as a tourist destination. From a driver’s perspective, I love that you have all day to cruise around and take in the sights before heading to the races. It’s good from both sides of the fence." Baird drives in the 11-race 2012 Porsche Carrera Cup Asia. 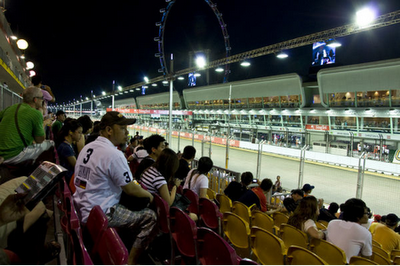 Round nine of the series will be a support event during the F1 Singtel 2012 Grand Prix weekend. What is on the other side of the fence bears a close watch. A slowdown in the global economy could have an effect on spending, which could mean fewer tourists and/or fewer dollars spent by tourists while visiting. Singapore also faces competition from its own region where Grand Prix hosts such as Australia, China and India (who is making its own F1 debut this season, as is the Circuit of the Americas) are doing more and spending more in order to make their own sites worthy of being considered destination venues. Bernie Ecclestone, Formula One Chief Executive Officer, did not respond to an email query seeking comment.